Attic insulation contains objects impossible to avoid, causing catastrophic damage to the fan, chamber, and engine.Our Cool Vacuum Savers are the answer to vacuum machine damage. The Vacuum Saver is an inline device that catches machine damaging objects before they reach your vacuum. 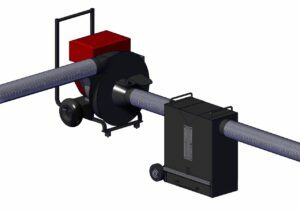 Simply connect the unit in the suction line, in front of the vacuum, and continue with your job. Large access door allows the unit to be cleared of collected debris. Designed for use with all our vacuums. An integrated Stainless SlideGate lets the operators clear the unit of debris without machine shutdown. A removable catch drawer allows for easy debris removal from unit. (Optional) Wheel package making this unit even more mobile while hooked-up.